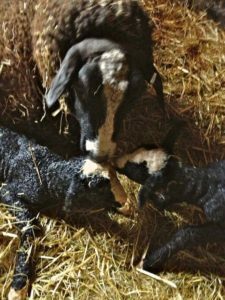 Last October 2012 when I introduced the Zwartbles Rams to the Zwartbles Ewes I was hoping for a very concise lambing near the beginning of March 2013. 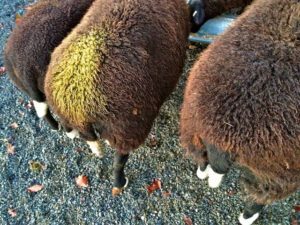 I painted a marker color onto the rams chest area so that when he mates with a ewe he leaves paint all over their backside showing me the deed has been done. After 3 weeks I change the paint color to see what ewes are covered by the ram a second time around. A Ram Marked Ewe in the Second Cycle. This ewe was the only one to show the yellow of the second color of paint. 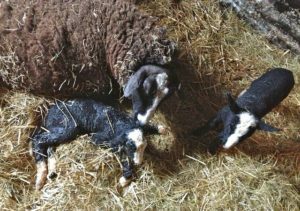 I could have almost predicted that this would happen to this particular ewe as she always likes to be last to lamb. 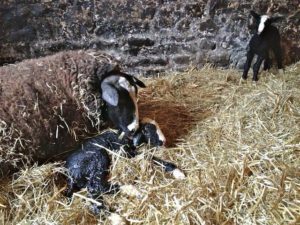 So all the flock had lambed and I was left waiting for this one ewe to lamb. Waiting and Waiting!! 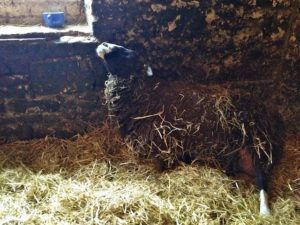 She happily eating and sleeping in a nice cozy stable, not really bothered but getting bigger and bigger as the days past. 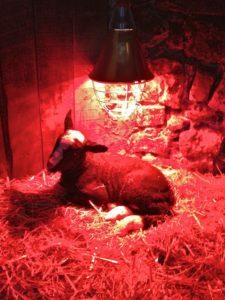 I’m pretty sure she will need help as she is well over due so the lambs will be very big when they are ready to come out. So I stick around and let her do her thing as much as possible before I will intervene. Straining and pushing, so far a pair of front toes and nose all correct. My mug of tea is sitting in the window as she came over to lie down next to me. I only moved away to take a photo returning to the window to sit and wait. The water bag didn’t break so I had to drop the camera phone and pop and pull this huge ram lamb out. Maa Cleaning Her First Born. 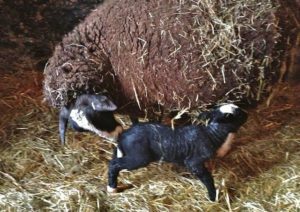 After pulling the ram lamb out making and sure its air ways were clear and it was breathing easily, I then placed him right under her nose so she could clean him up. She got busy cleaning around the nose area like all good mother do. 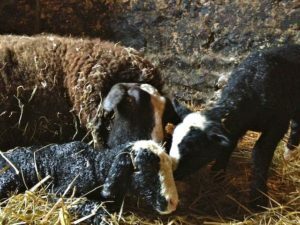 The lamb lifts it’s wobbly head, both Maa and lamb mumbling and muttering to each other. Finally up on his wobblies looking for first suckle. Multi tasking like no other!! 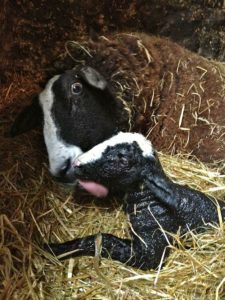 Nursing and cleaning her first born while second lamb is on the way. 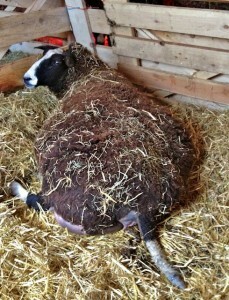 You can see two white front hooves sticking out under her tail. I end up having to pull this one out as well and it took some strength!! 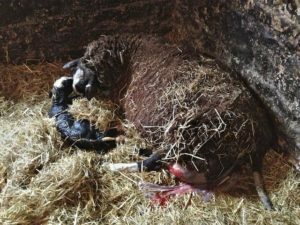 It was a huge ram lamb. 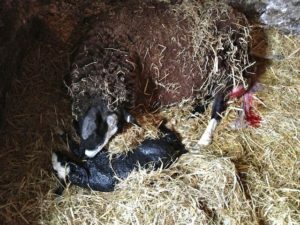 Nursing and Cleaning First Born While Second Lamb is on the Way. 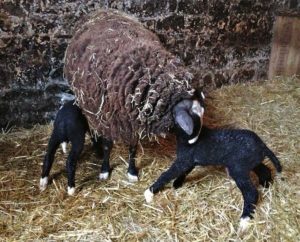 Two huge ram lambs and I feel that there still might be more to come. 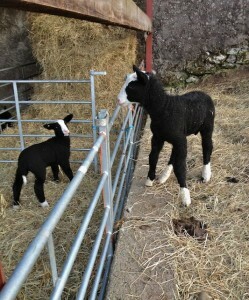 As time passes I come to realize there are no more lambs just these two enormous ones. 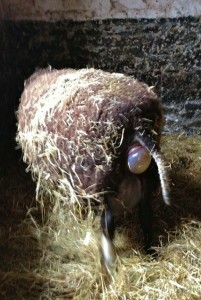 Mothers Work Will Not be Done for a While as Both Boys Need to Get Dry, Warm and First Milk. 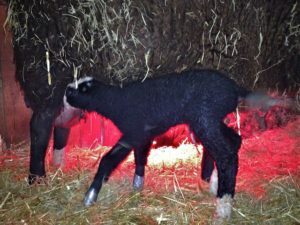 Second lamb gets up and is huge, so much so that his front legs keep knuckling over. 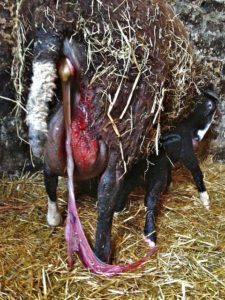 This is due to the fact he was so big inside his Mother that he was very tightly curled up. You can see the front left bending over in the photograph.. The Front Left Pastern Bending. 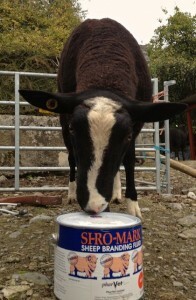 Hoping he will over come his knuckling pasterns I go feed other animals and return. He is still trying but not succeeding in nursing from his Maa. 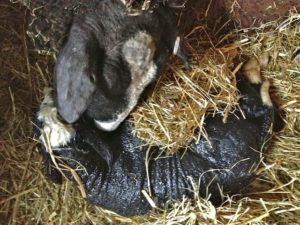 His older brother is fine resting under the warmth with a full belly of colostrum. 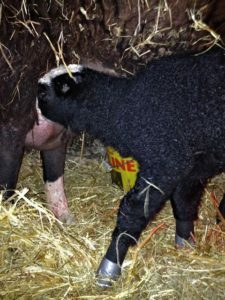 So I take the second lamb and straighten his pasterns out wrapping them with vet wrap, then strengthen with several wraps of duct tape, creating a soft cast to support bendy limbs. Bingo he is a happy baby and is suckling almost at once. 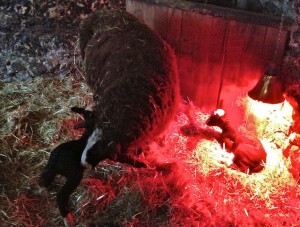 I’ll leave them on for only 24/48 hours as lambs grow so fast. 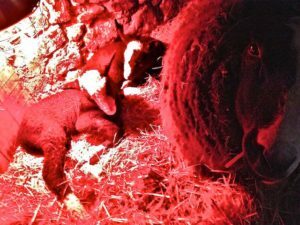 Two Happy HUGE Ram Lamb Twins Snoozing off the Trauma of Birth with Proud Maaa Watching Over Them. I’ve just removed the soft castes from the front pasterns from lamb on right. He now looks down on his old brother. Both legs are fine not a bother on him. 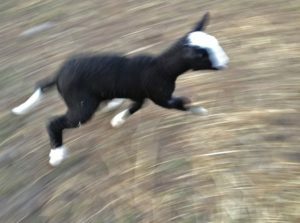 He is Trotting Happily off to His Maaa.